The World Cup heads to Brazil for 2014, and the hosts are already under huge pressure. Can they win, and win in style? And will travel issues spoil the party? Sixty years ago one of the all-time great Brazil sides thrashed Sweden 7-1 and Spain 6-1. Then, needing just a draw to become world champions, they found the occasion too much and let Uruguay come from behind to win 2-1. That was in 1950, the last time Brazil staged the World Cup. Then, there were only 50 million Brazilians demanding victory. In four years' time, there will be 200 million. The pressure facing the Brazil side who will host the next tournament in 2014 will be greater than any other team has ever known – and the squad will have to be built from scratch. 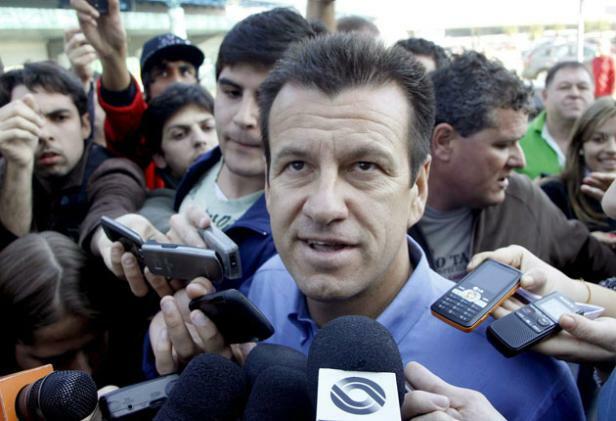 The side Dunga took to South Africa was one of the oldest ever to represent Brazil in a World Cup. Few of them will be around in 2014. There will be no qualifiers for the hosts to prepare their players – at senior level between now and the next World Cup there is only the 2011 Copa America and the Confederations Cup two years later. Alarm bells are ringing in the CBF, Brazil's FA. A new coach will almost certainly be appointed in the next two weeks – in a month's time Brazil are back in action in a friendly against the United States. But more important than the haste is the long haul. CBF president Ricardo Teixeira is keen for the new man to take on responsibility for grooming the next generation – in addition to the senior side, he is also likely to take charge of the Under-20s and, assuming Brazil qualify, the Under-23 side that will go to the London Olympics. This, then, is an important choice for the future direction of the national team – and it comes at a fascinating moment. Brazil's status – and attraction to its international sponsors – is based as much on quality as quantity. As important as the five World Cups won is the manner in which its best teams have played. Brazil are the great entertainers, the spiritual guardians of the "jogo bonito", the beautiful game. But the advertising line is under attack from reality. Brazil continue to count on breathtaking individual talent, but the team in South Africa were only the latest in a line of pragmatic sides. Where the central midfield was once populated by the world's best passers of the ball, these days Brazil choose artless giants whose skills are primarily defensive. This goes far beyond Dunga – it is the direction that Brazilian football has taken. Similar traits could be observed last year in Brazil's teams at both the Under-17 and Under-20 World Cups. In the brutal world of domestic Brazilian football, where the job security of coaches is notoriously precarious, there is little space for the romantic dreamer. The coaches are usually hard-headed pragmatists. In recent years, the most successful has been Muricy Ramalho, now with Fluminense having previously won three consecutive league titles with Sao Paulo between 2006 and 2009. An arch-pragmatist, he makes no concessions whatsoever to style. Can Brazil's reputation survive another coach with these characteristics? Leonardo would be an interesting wild card. The former international has never coached in Brazil, but has top-level experience in Europe after spending last season in charge of Milan – and despite his sacking, he did better than might have been expected after inheriting an ageing squad that had just lost his fellow countryman Kaka to Real Madrid. Excellent at public relations and with an idealistic commitment to attacking football, Leonardo has announced that he is interested and available – which gives him an advantage over the people's choice. Luiz Felipe Scolari's photograph was on the front page of daily sport newspaper Lance! after Brazil lost their quarter-final to Holland. Following his adventure in Portugal, England and Uzbekistan, Scolari has returned to Brazil – but has rejoined Palmeiras, where he is set to be under contract until the end of 2012. Teixeira has dismissed the idea that Brazil could share their coach with a club side, leaving Scolari out of the running unless he walks out on a club he has just joined. It could be that Scolari is playing a waiting game. Teixeira admits that short-term results are not a priority, but every defeat of the national team sets off a mini-crisis in the Brazilian media. Losing matches is more likely with a young team in formation – it happened on the watch of Falcao, when the great midfielder set about rebuilding Brazil after the 1990 World Cup. Results cost him his job. After years as a TV pundit, Falcao is an outside bet to return. But whoever takes over now runs the risk of paying the price of the rebuilding process – leaving Scolari to pick up the reins in the final straight and make a bid for immortality by steering Brazil to victory on home turf.